Imagine stepping out for a night at an exquisite location, a location emanating grandeur and opulence, in anticipation of pampered entertainment. A night at the movies. From the Los Angeles Broadway district to Hollywood and Westwood, Los Angeles did not need to take a back seat to any city in the area of extravagant theatres. However, times have changed, and 24 cinema multiplexes are now prevalent throughout each and every neighborhood. Here's a look back at many of the area's old historic theatres, many that held great significance. Some may even be still showing movies or plays. 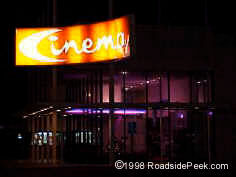 Check some of them out here at Roadside Peek's Grand Theatres section. 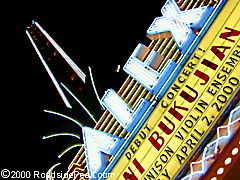 The Fox Theatre brand name has always been synonymous for grand looking theatres. See some of them here at Roadside Peek's Fox Theatres. 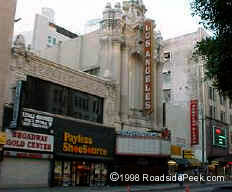 The Broadway Theatre District in Los Angeles contains some of the most extravagant and opulent theatres found anywhere. From the Los Angeles and Orpheum to the Mayan, the Broadway area theatres were a sight to be seen from 1890 to the post-war 1950's. A few of these theatre are still open. Others are now swap-meet like shops or churches. Still others are closed down, perhaps for good. Classic Theaters around the Southern California area include some, like the Golden Gate, damaged and closed due to earthquakes. Others are closed down due to lack of guests. Still others are affected by the huge influx of multi-screen cinemas of recent year. As these megaplexes take over neighborhoods, venerable single-screeners are feeling the squeeze in customers and profits. Perhaps one day we will look back at the golden-age of the single-screener, and remember the spaciousness and uniqueness of each theatre. 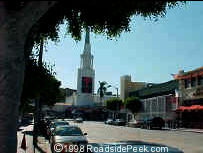 Westwood Village... a university town with some of the best known single-screen theaters in the area. From Mann's Fox Village to the Mann National, the best of the first run movies play here in Westwood. Movie stars are sometimes seen here during openings of blockbuster hopefuls. 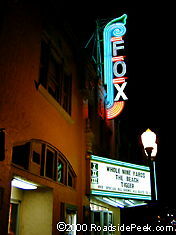 On a historical note, the Fox Village is one of the few remaining from the famous "Fox" vintage line of movie theatres. This special section of Grand Theatres features a look at the ones which glow at night. 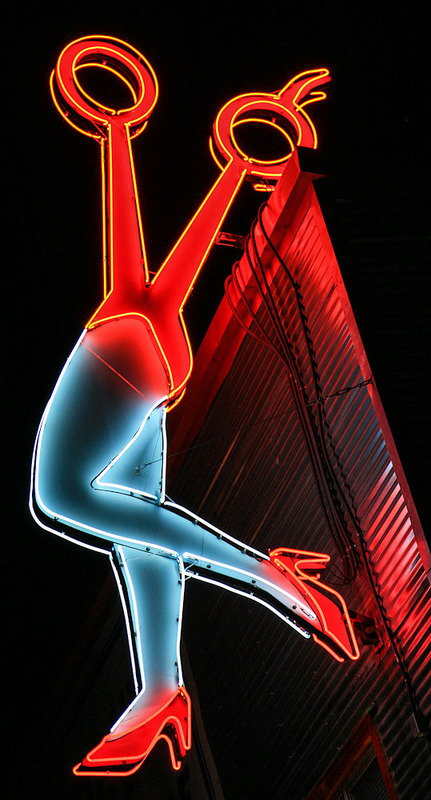 Yes, the Neon Theatres that catch your eye. Hollywood, a place of glitz and glamour. And not to mention neon. 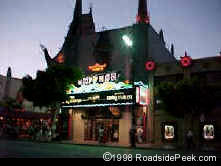 Hollywood Theatres on Hollywood Boulevard include the venerable Mann's Chinese Theater and Pantages. Sunset includes the well-known and famous Cinerama Dome, soon to undergo significant renovation on the interior.